Report: Chinese Activist Left Embassy Because His Wife's Life Was Threatened : The Two-Way Chen Guangcheng escaped from house arrest on April 22 and sought refuge at the U.S. embassy in Beijing. After negotiations, Chinese authorities said they would allow him to live freely and study at a university. But darker reports are emerging. 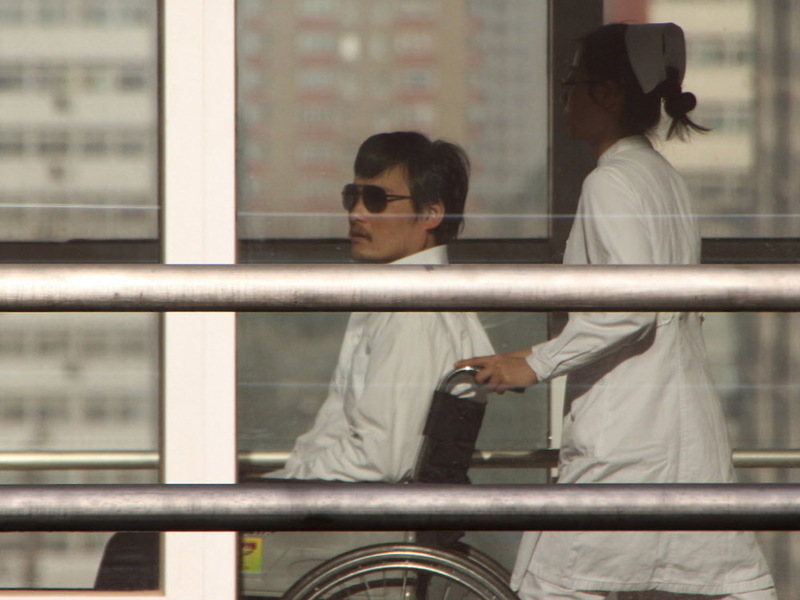 Chinese activist activist Chen Guangcheng earlier today at the a hospital in Beijing. He reportedly injured himself during his escape from house arrest last month. Chinese legal activist Chen Guangcheng has said to The Associated Press that "he was told Chinese officials would have killed his wife had he not left [the U.S.] embassy," the wire service reports. It also writes that "Guangcheng says a U.S. official told him that Chinese authorities threatened to beat his wife to death had be not left the American Embassy." And the AP adds that he "says he now wants to leave China [and] fears for [his] family's safety." Also, "activist Zeng Jinyan told The Associated Press on Wednesday via Skype that Chinese officials forced Chen to choose between going into exile alone or staying in China with his family." Those accounts vary from the word earlier today, via U.S. officials, that Chen had freely decided to leave the U.S. embassy, where had been staying for the past week or so following his escape from house arrest, and that Chinese officials had made assurances that he would be safe. The latest news underscores, though, the expressions of unease we reported about earlier. Update at 4:25 p.m. ET. So, What's Going On Here? "I probably was in 30 or 40 hours of conversation with him. Every single discussion was about the possibility of how to go back and live a more normal life in China and what we could do to help in that effort. Never once did he talk about asylum or coming to the United States. And I think he fully recognizes what are some of the challenges that people who come to the United States in these circumstances face. "I do believe that he has anxiety about the period ahead, but I also know from my discussions with him that he feels that the United States and the people that he's worked with and others and nonprofits, just an enormous number of supporters will be behind him as he goes forward. And I think in this set of circumstances, that's the best you can ask for. "Veteran China watchers say that the U.S. officials who negotiated the deal for Chen to leave the embassy and the Chinese officials who approved the deal may be feeling burned by later Chen's statements.
" 'This was really hard for the Chinese to do,' says Susan Shirk, head of the 21st Century China Program at the University of California. Shirk says the deal was apparently made over the objections of 'hard-line voices at the top' of China's political hierarchy.
" 'It was pretty amazing diplomacy by the two sides—achieving the outcome Chen wanted,' she adds. "Jeffrey Bader, who served in the Obama administration as a National Security Council adviser on China, says there's good reason to believe the State Department officials who say they never conveyed any threat from the Chinese to Chen. "Bader, now a senior fellow at the Brookings Institution, notes that the Americans negotiated as a multi-member team, so there wouldn't be any ambiguity about what was agreed upon. "Bader adds that Chen and the people he's associated with have at least two good reasons to keep him in the spotlight: to keep attention on his cause and also, to assure him of some measure of safety by keeping him under media scrutiny." Chen has told CNN that "if he stays here, he will not live," the news network's Stan Grant just said on the air. Chen also said he "feels he's been let down by the United States," Grant reported, because while in the embassy he was "cut off from the news and was encouraged to leave." After leaving the embassy, Chen told CNN, he learned from his wife about ongoing threats to her life from authorities. NPR's Michele Kelemen reports that the U.S. State Department spokeswoman Victoria Nuland says in an email that "at no time did any U.S. official speak to Chen about physical or legal threats to his wife and children. Nor did Chinese officials make any such threats to us." Nuland adds, though, that "U.S. interlocutors did make clear that if Chen elected to stay in the embassy, Chinese officials had indicated to us that his family would be returned to Shandong, and they would lose their opportunity to negotiate for reunification." "At no point during his time in the Embassy did Chen ever request political asylum in the US. At every opportunity, he expressed his desire to stay in China, reunify with his family, continue his education and work for reform in his country. All our diplomacy was directed at putting him in the best possible position to achieve his objectives." Our original post — "Will China Follow Through On Assurances About Activist's Safety?" Will Chinese authorities follow through on those assurances? "He was escorted from the [U.S.] embassy to the hospital. But, frankly, he can't be escorted around China for the rest of his life," Richard McGregor, Washington bureau chief for The Financial Times said earlier on Morning Edition. As he pointed out, "in the past, Chen was actually snatched from the capital" by authorities from his home city. "Who's to say what can happen in the future? ... Assurances only go so far." As NPR's Louisa Lim added, "a lot depends on how this now plays out." "Mr. Chen has a number of understandings with the Chinese government about his future, including the opportunity to pursue higher education in a safe environment. Making these commitments a reality is the next crucial task. The United States government and the American people are committed to remaining engaged with Mr. Chen and his family in the days, weeks, and years ahead." For his part, Chen told Clinton, "I want to kiss you," during a phone call following his departure from the U.S. embassy — where he had been staying since escaping from house arrest on April 22. Chen, a self-trained lawyer, had run afoul of authorities in recent years because of his work to expose a campaign of forced abortions. He reportedly injured himself during his flight from house arrest. Chinese authorities have asked the U.S. to apologize for allowing Chen to seek shelter at the U.S. embassy in Beijing. Until today, American officials had not acknowledged their role in the affair.